In a large skillet, cook pork in hot oil over medium heat until well browned on all sides. Place pork in a 4- to 5-quart slow cooker; sprinkle lightly with salt and pepper. 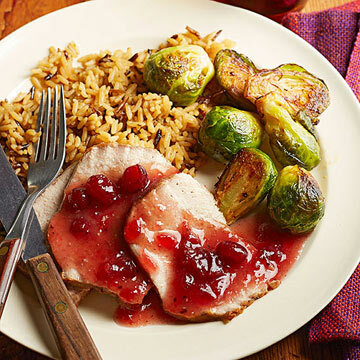 In a medium bowl combine half of the cranberry sauce (3/4 cup), 1/2 cup cranberry juice, sugar, mustard and cloves. Pour over roast. Cover and cook on low-heat setting for 6 to 7 hours or on high-heat setting for 3 to 3 1/2 hours. Transfer meat to a platter; cover and keep warm. Skim fat from juices. Measure 1 1/2 cups of juices; transfer to a medium saucepan. Combine cornstarch and 2 tablespoons cranberry juice in a small bowl; add to saucepan. Cook and stir over medium heat until thickened and bubbly; cook and stir 2 minutes more. Stir in remaining cranberry sauce. Serve with roast and, if you like, rice pilaf, rice or noodles.